Photo provided by Martina Ruckova. The Coffee Cultural Landscape comprises 6 landscapes and 18 urban centres within the coffee producing areas in the Andes. 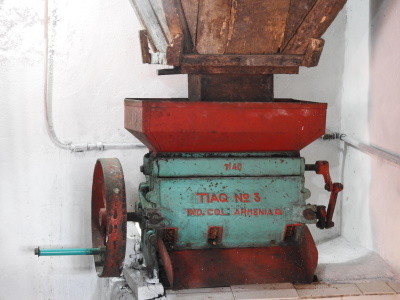 The growing of coffee started here in the 19th century, and currently accounts for 35% of Colombia's total production. Like many members, I am often bewildered when trying to determine exactly what I am supposed to see when visiting a Cultural Landscape site. Colombia's recently-inscribed Coffee Cultural Landscape is a perfect example of that. As I prepared my recent visit, there was a map available on the UNESCO page for this site that, in theory, gives the location of the core- and buffer-zones of this site. However, the map is close to impossible to read easily, seemingly being created from whatever public-domain map its creators could find. Text labels for cities and towns are sometimes in the wrong place, and the roadways, and other landmarks, are also not very clear. Nevertheless, after staring at this map for a long time, I was able to determine that I would pass through two sections of the core zone on my recent cycling trip, namely the town of Anserma (presumably all of the city center is not included, but the area just beyond that is), where I spent one night, and the roadway connecting the towns of Viterbo and Apia. There is certainly coffee being grown in these areas, though maybe not as much as you might expect. There is also a lot of sugarcane and bananas, though the latter are often used as a shade crop for coffee. I did not notice any sort of buildings or other infrastructures involved in the processing of coffee in these two areas. The only informational items relating to the WHS that I saw were a new road sign over the highway leading into Apia from the west that said "Apia: Coffee Cultural Landscape" (in Spanish) with the WHC logo (I'm not sure about the eastern approach since I used the very hilly, rocky "short-cut" road in that case,) and a mural in a narrow hallway inside the old hotel where I stayed in Anserma that is the photo for this review. 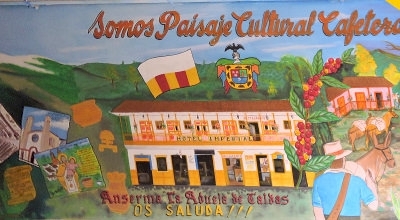 It says: "We are Coffee Cultural Landscape", "Anserma is Grandmother of the Caldas (region)" "Greets you." Overall this site does feel more like a marketing ploy than a WHS, but a lot of people like to drink Coffee, so perhaps that is understandable. I probably should have drank a cup while I was there, for the experience, but I don't really like coffee, so I didn't. First of all - it is not easy to distinguish what exactly was inscribed as Coffee Cultural Landscape - particular coffee farms, land area, towns and villages. All available maps do not show inscribed zone, there are no signs of World Heritage in the places (yet, November 2011) that is for sure inscribed as UNESCO heritage. But for sure the landscapes are spectacular although I haven't seen any difference between inscribed part and non-inscribed. I was visiting Salamina, passing through Chinchina, travelling around Salento, Manizales, Armenia and Pereira. Those areas are either directly inscribed as WHS (Salamina, Chinchina) or located in close vicinity of Coffee Cultural Landscape. Salamina is truly remarkable (nice colonial town, sourrounded by high mountains, with lovely old houses, one the most interesting places in Colombia). Chinchina looks to be quite ordinary, like many other towns.